In the chart illustrative of this topic, we have sought to aid the mind through the eye, to understand something of the progressive character of God’s plan; also, the progressive steps which must be taken by all who ever attain to the divine nature. First, we have an outline of the various dispensations, A,B,C. The first (A) lasting from man’s creation to the flood; the second (B) from the flood to the commencement of the Millennial reign at the second advent; and the third, or „Dispensation of the fullness of times,” (C) lasting from the beginning of Christ’s reign for untold ages—”ages to come.”—Eph. 2:7.
righteous suffer, while in the world to come the rule is to be reversed; righteousness will rule and evil-doers will suffer, and finally all evil be destroyed, so that every knee shall bow and every tongue confess to the glory of God. Secondly, we find that the two last of these dispensations (B and C) are composed of various ages—each of which as a successive step leads upward and onward in God’s plan. Age D was the one during which God’s plan was represented and typified by such patriarchs as Abraham, Isaac and Jacob, etc. Age E is the Jewish age, or the period from the death of Jacob, during which all of his posterity are treated of God, as his especial charge—his favored people. To these he showed special favors and declared—”You only have I known (recognized with favor) of all the families of the earth.”—Amos 3:2. These as a nation were typical of the Gospel Church—the „holy nation—the peculiar people.” The promises, etc., made to them were typical of „better promises” made to us. Their journey through the wilderness to the land of promise (Canaan) was typical of our journey through the wilderness of sin to the heavenly Canaan. Their sacrifices justified them typically and not really, „for the blood of bulls and goats … can never take away sin.” But in the Gospel age (F) we have the „better sacrifices,” which do make atonement for the sins of the whole world. We have the „royal priesthood,” of which Jesus is the chief, or „head,” composed of all those who offer themselves to God „living sacrifices,” holy and acceptable, through Jesus Christ. In the Gospel age we find all the realities of which the Jewish age and its services and ordinances were but a shadow—the Law being „a shadow of good things to come.”—Heb. 10:1. Theirs was all typical, ours is all real. of the divine nature.—2 Pet. 1:4. Evil is still permitted to reign over or rule the world, in order that by contact with it, these may be tried to see whether they be willing to give up the human—a living sacrifice—being made conformable to Jesus’ death, that they may be also in his likeness in the (First) resurrection. G is the Millennial age (one thousand years,) during which Christ Jesus shall reign and rule and thereby bless all the families of the earth, accomplishing the „restitution of all things spoken by the mouth of all the holy prophets.”—Acts 3:19-21. With this age sin and misery and death shall be forever blotted out, for „he must reign until he hath put all enemies under his feet. … The last enemy that shall be destroyed is death„—the Adamic death. During this reign and associated in it with Jesus, will be the church called the Bride—his body—”To him that overcometh will I grant to sit with me in my throne even as I overcame and am set down (during the Gospel age) with my Father in his throne.” Blessed privilege to be thus intimately associated with our Lord in the great work of blessing all men—as „kings and priests unto God.” H shows „ages to come;” ages of perfection, blessedness and happiness for all, but regarding the work of which Scripture is silent. The „HARVEST” at the end of the Jewish age was a period of forty years, lasting from the beginning of Jesus’ ministry, when he was anointed of God by the Spirit (Acts 10:37,) and began his ministry (A.D. 30,) until the destruction of Jerusalem (A.D. 70.) In this harvest the Jewish age ended and the Gospel age began. There was a lapping of the ages, as you will note, by careful examination of the diagram. (seventieth) week,” Messiah should be cut off (die), but not for himself („Christ died for our sins:”) and thus did he cause the sacrifice and oblation to cease in the midst of the week—three and one-half years before the expiration of the seventy covenant weeks. When the true sacrifice had been made, of course, the typical ones would no longer be recognized by Jehovah. was concerned; but their national existence terminated in the great time of trouble which soon followed, resulting in the destruction of their city and nation. In that „harvest” the Gospel age had it beginning also: this age is designed for the development and trial of „the Christ of God„—head (Jesus) and body (the church.) It is the Spirit dispensation, hence, it is proper to say that the Gospel age began with the anointing of Jesus (our head) „by the Holy Ghost, with power,” (Acts 10:38; Luke 3:22; 4:1,18,) at the time of his baptism; while in another sense we might say that it commenced at Pentecost, three and one-half years later, when the Spirit came upon his body, which is the church. A „HARVEST” will constitute the closing period of the Gospel age, during which there will again be a lapping of ages—the Gospel age ending and the Restitution or Millennial age beginning. 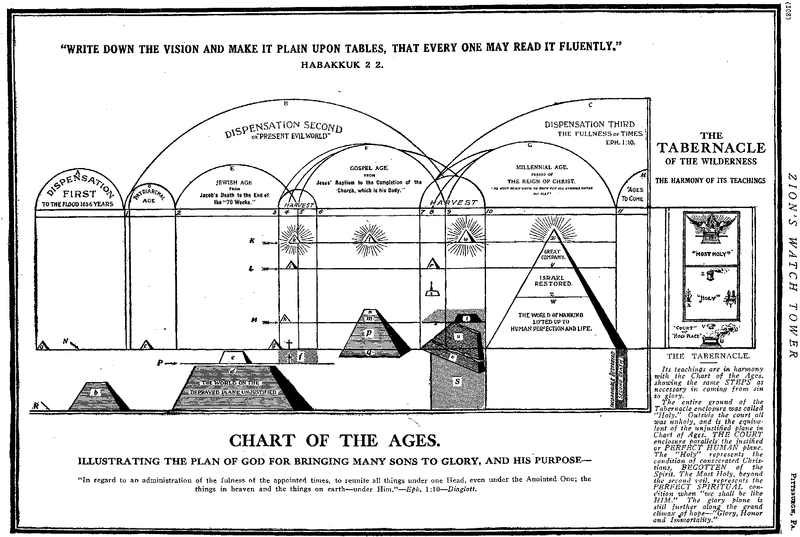 This age closes by stages, as did its pattern or „shadow”—the Jewish age. As there, the first seven years of the harvest were devoted in an especial sense to a work in and for the Jewish church and were years of favor; so here we find a similar seven years marked as having the same meaning and bearing upon the Gospel church, to be followed by a period of trouble (judgments—seven last plagues, etc., called „fire,”) upon the nations of the world as a punishment for wickedness, and as a preparation for the reign of righteousness; of which more again. which you possess, to God’s service, that henceforth you shall live not for self, nor for friends, nor family, nor for the world, nor for anything, but for and in the service of him, who bought you with his own precious blood. But Paul, surely God would not accept of blemished or imperfect sacrifices, and since we all became sinners through Adam, we cannot surely be sacrifices, can we? Yes, beloved, it is because you are holy that you are acceptable sacrifices, and you are holy and free from sin, because God has justified you from all sin freely through Christ’s death. dead to all human things, and a further thing to perform that covenant throughout your earthly career,—keep your body under (dead); keep your own will out of sight, and perform only the Lord’s will. The entrance upon plane L is called birth, or a full entrance into life as a spiritual being—like unto Christ’s glorious body, and like unto the angels. We cannot enter on that plane until the entire church is gathered in from the world—when „the dead in Christ shall rise first,” (this corruption must put on incorruption—immortality.) Then we, which are alive and remain, (not having entered the tomb) shall be changed in a moment—made perfect spiritual beings like unto Christ’s glorious body (for „this mortal must put on immortality.”) Then, that which is perfect being come, that which is in part (the begotten condition with the various hindrances of the flesh, to which we are now subject) shall be done away. But there is a still further step to be taken beyond a perfection of spiritual being—viz., to „the glory that shall follow”—plane K. We do not refer to a glory of person, but to a glory of power or office. The reaching of plane L brings us to a full personal glory, i.e., to be glorious beings like unto Christ’s glorious body. But after we are thus perfected, and made entirely like our Lord and head, we are to be associated with him in the glory of power and office—to sit with him in his throne, even as he after his being perfected at his resurrection, a glorious being, was exalted to the right hand of the majesty (glory) on high: so we shall enter in everlasting glory—plane K.
(a) represents Adam; he was a perfect being and hence a pyramid. Notice that he is on plane N, which shows that Adam was a perfect man (before he sinned). (d) represents the world of mankind after the flood still on plane R—still at enmity, where they continue until the Gospel church is selected and the Millennial age begins. (f) represents the (fire) trial through which fleshly Israel went when Jesus was present, sifting them and taking out of their nominal church the wheat or „Israelites indeed, in whom was no guile,” and especially after the separation of the wheat when he „burned up the chaff (refuse part of that church and nation) with unquenchable fire,” (a time of trouble, etc., which they were powerless to avert. )—See Luke 3:17; also, 21:22; and 1 Thess. 2:16.
for a tooth, and a life for a life; it was necessary that a man should die for mankind or the penalty (man’s death) would not be paid: hence the death of an angel would no more pay the penalty and release man, than the death of „bulls and goats, which can never take away sin.” Therefore, the first-begotten of God became a man, that he might give that which would redeem mankind. He must have been a perfect or sinless man, else he could do no more than any member of the fallen race to pay the price. He was „holy, harmless, undefiled, and separate from sinners.” He took the same form or likeness which the sinners had—”the likeness of sinful flesh”—the human. This filling with the spirit was the begetting to a higher form of being, which he should receive when he had fully accomplished the offering—sacrifice of the human nature. This was a step up from human conditions, and is shown by pyramid h, on the spirit-begotten plane, M. On this plane (M) Jesus spent three and a-half years of his life—until it ended on the cross. Then, after being three days dead, he was raised to life—quickened of the spirit to the perfection of spiritual being, (i plane L) for now he was born of the spirit—”The first-born from the dead.” „That which is born of the spirit, is spirit;” Jesus, therefore, at and after his resurrection, was a spirit—a spiritual being, and no longer a human being in any sense. no longer was controlled by human conditions, but could go and come as the wind (even when the doors were shut) and none could tell whence he came nor whither he went,—”so is every one that is born of the spirit.”—John 3:8. From the moment of consecration (baptism) the human had been reckoned dead—and there the new nature began (begotten) plane, M,) which was completed at the resurrection, when he reached the perfect spiritual plane, L—raised a spiritual body. Forty days after his resurrection Jesus ascended to the majesty on high—the glory plane, K, (see pyramid k.) During the Gospel age he has been in glory, l, „set down with the Father on his throne,” and during this time he has been the head over his church on earth,—her director and guide. During all this Gospel age the church is in process of development, discipline and trial to the intent, that in the end, or harvest of the Gospel age, she may become his bride and joint-heir. Hence she has fellowship in his sufferings, that she may be also glorified together with him, (plane K,) when the proper time shall come. and are no longer enemies, but justified human sons, on the same plane as Adam and Jesus, except that they were actually perfect, while we are reckoned so, of God, and know it, because God’s word tells us so; „ye are justified freely from all things.” We stand in God’s sight absolutely spotless, because Jesus’ robe of righteousness cover all our imperfections. But remember that while justification is a blessed thing, it does not change your nature—you are still a human being, and unless you proceed you will never be a spiritual being—never be anything but a human being. You are saved from the wretched state of sin and alienation from God, and, instead of being a human sinner, you are a human son, and now because you are a son, God speaks to you as such, saying, „My son, give me thy heart:” that is, give yourself, all your earthly powers, will, talents—your all to me (as Jesus hath set us an example) and I will make you a son on a higher plane than the human; I will make you a spiritual being (i.e. a being with a spiritual body) like the risen Jesus—”the express image of the Father’s person.” If you will give up all of the earthly and consecrate it entirely to me and use it up in my service, I will give you a higher nature than the rest of your race—I will make you „partakers of the divine nature„—make you „heirs of God and joint-heirs with Christ; if so be that you suffer with him, that you may be also glorified together.”—Rom. 8:17. We know not how long it will be after our perfecting as spiritual beings (plane L) before we shall be glorified (plane K) with him: united with him in power. This uniting we understand to be the „marriage of the Lamb” to his Bride, when she shall thus—enter into the joys of her Lord. these companies, the earthly nature must be destroyed; but in the case of the „great company,” m, it is taken from them, while in the case of the „little flock” it is, as it was, with Jesus, the example—a willing sacrifice. Oh, if we prize our Father’s approval, if we desire our Lord’s smile, if we desire to be members of his body—his Bride—and to sit on his throne, we must fulfill our covenant of sacrifice! I beseech you, brethren, by the mercies of God, that ye present your bodies a living sacrifice—holy, acceptable unto God, your reasonable service. p represents the majority of the nominal church. You will notice that they are not on plane M, but on plane N; they are justified, but not sanctified (not entirely consecrated to God,) not begotten, therefore, as spiritual beings at all. They are higher than the world, because they accept of Jesus as their ransom from sin, but they have not come high enough to be a part of the real church—the spiritual family, and unless they progress and sacrifice the human, they will never be anything but human, and in the resurrection they will be in the likeness of the earthly man, Adam, whereas those who sacrifice the human, will be in the likeness of the Lord—like unto Christ’s glorious body. q represents a class connected with the nominal church who never did believe in Jesus as the sacrifice for their sins and who consequently are not justified—not on plane N. They are „wolves in sheep’s clothing”—they are in no sense a part of the church—they belong to plane R, are part of the world and are out of place in, and a great injury to, the church. Thus, in a mixed condition, the church has existed throughout the Gospel age: as our Lord had foretold—the kingdom of heaven (church) is like unto wheat and tares in a field (the world)—”Let both grow together until the harvest. In the time of harvest I will say unto the reapers (the angels,) gather together the tares and bind them in bundles to burn (destroy) them, but gather the wheat into my barn.—Matt. 13:38,41,49.
that there should come a time of separating between these different elements. This division comes in the end of the age, for „the harvest is the end of the age.”—Vs. 39. The second advent of Jesus, leaving the plane of glory, K, and coming to the unglorified spiritual plane, L, is shown by figure r. As has been stated heretofore, we believe that the prophets, etc.,* teach that we are now in the „harvest” of this age; that our Lord has come, and the work of harvest, or separating wheat from tares, has been progressing since A.D. 1874. The first work of the Lord in this harvest will be to separate the true from the false, and the truly consecrated children from the unconsecrated ones. This work we believe is now going on. *The Chronology, time proofs, etc., can be had in a book entitled „Millennial Day Dawn,” soon to be published from this office. restitution, and this God hath promised to men. When restored they will be in no danger of falling, because no longer liable to mistake evil for good—knowing both. In Rev. 20:9, we learn that some will be destroyed in the end of the Millennial reign, because when presented full opportunity to become perfect men, and in harmony with God and his law of love, they chose evil. Such die the second death, from which there is no resurrection, nor restitution. When we look at our Father’s great plan for the exaltation of the church, and the blessing through her, of Israel, and all the families of the earth, by a restitution of all things, it reminds us of the song of the angels: „Glory to God in the highest; on earth peace, good will toward men!” That will be the consummation of God’s plan—”the gathering together of all things in (under) Christ.” O the height and depth, the length and breadth, of the love of God which passeth all understanding! Who will say that God’s plan has been a failure then? Who will say that he has not overruled evil for good and made both the wrath of man and of devils to praise him?